New research from Zendrive estimates 600 million distracted driving incidents in the U.S. each day. New research monitoring cell phone use while driving suggests the scale of motorist distraction is off the charts. Motorists with smartphones use hand-held devices in 88 out of every 100 trips, according to data collected by Zendrive, a company that assesses driving behavior using the sensors in smartphones. More than three quarters of drivers—77 percent—have smartphones. Extrapolating to the entire population, Zendrive estimates there are about 600 million trips involving distracted driving in the United States each day. Nationwide, traffic deaths have risen at an alarming rate in recent years, and cellphone use is often cited as a potential culprit, but data is limited. Federal agencies including the CDC and the NHTSA have estimated that distracted driving is a factor in about one in 10 traffic deaths annually. But the research from Zendrive indicates the extent of the problem may be much larger. The dataset was collected over 90 days from 10 billion miles driven by 5 million motorists with Zendrive’s tech running on their devices, including both professional drivers and non-professionals. Oregon was the least distracted state and Vermont was the most. In Vermont, drivers spent an average of 7.5 percent of driving time texting or using apps on their phones. In Oregon, it was about 3.5 percent. Some federal safety regulators have pushed for safeguards that allow drivers to voluntarily disable certain smartphone functions while behind the wheel, but the consumer electronics industry has pushed back. State laws banning the use of hand-held phones while driving may have an effect. There are 16 states with such bans in effect, and six of those states are among the 10 least-distracted in Zendrive’s dataset. 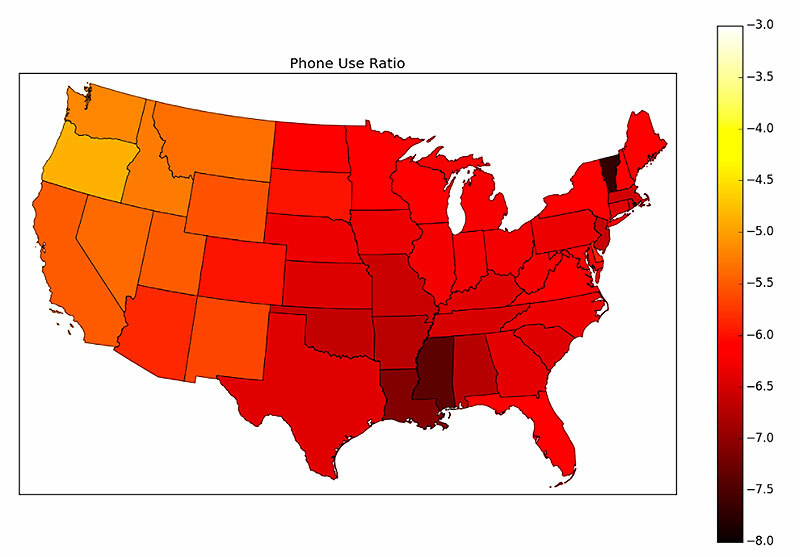 However, Vermont, the most distracted state, also has a cell phone ban.